Shoppers, Meet Fountain Square Outfitters! There's a new kid on the block...help us welcome Fountain Square Outfitters to Glens Falls, NY! Join us as we celebrate the opening of this brand new store at 1 Ridge Street in downtown Glens Falls, NY! This multifaceted retailer is featuring the Patagonia brand and many more for 2011. Owners, Nancy and Matt Fuller, are eager to open the doors to their new store this month. We interviewed them recently and here's what they said about Fountain Square Outfitters, LLC. 1. What's the story behind Fountain Square Outfitters (FSO)? It was during a vacation in Nantucket where 'Fountain Square Outfitters' was first scribbled down and daydreamed about. Fast-forward a year and a half, a few inquiries, a 'yes' from Patagonia, and a great location found, and you get... Reality! Introducing the most multifaceted clothing line (s) that you'll find not only in downtown Glens Falls, but in the adjacent areas surrounding the southern 'Dacks, and beyond. 2. What is your Vision for FSO? To provide our customers with access to quality, cross-usable clothing that is as versatile as their active, energy charged lifestyles. We believe people make purchases with quality and value in mind, as that's how we buy clothes. Because of the durability, you can wear our product line (s) on Main Street, or while hiking to Marcy Dam. We are informed, conscious and most importantly, ecological. Our short-term goal is to create a name and recognition that creates a sense of value, quality, and pride in our local economy. As the saying goes, we are all in this together, and small businesses are the backbone of our regional economy. 4. What are the long-term goals for FSO? To extend beyond Glens Falls and to take what we hope is a model, and bring it to other small business markets. Having more than one store doesn't make you a chain. We want to staff our stores with people who can relate to buyers, the outdoors, and bring a sense of comfort in a low pressure buying experience. 5. What do you hope to achieve with the look and feel of the store? Warm yet modern, with an adherence to reuse. We chose a location that is not new, and hope that if we have the opportunity to branch out, we can stick to that model. New stores are wonderful, but reusing an old space is better. 6. Why did you choose this space for the store? Location. The look and feel of the old brick, historic downtown feel. Location. The circle outside, surrounded by great businesses. Oh yeah... and the location. 7. What do you hope the store will bring to the Glens Falls region? People. We hope that our store creates foot traffic downtown. Yes, we want to offer products people want to purchase, and in the end, if we can generate that draw, a vibrant downtown benefits us all. 8. How will you make your brand memorable? Planet first. We will support companies who respect the environment. 9. Will your brand be community focused? How? Yes, we will support environmental and community-outdoor related initiatives focused on balancing our needs with our surroundings. 10. Who is your buyer? Describe your customer profile. Our buyer works hard, and plays hard. Our buyer selects products that are multifaceted; a fleece jacket that can be worn on a midwinter hike, and out to dinner later in the evening. In short, products that can be worn, beaten, cleaned, and return for duty the next day. 11. How is FSO different than an EMS? Patagonia? Dicks Sporting Goods? FSO is a broad selection of brands within a defined use. We aren't a climbing store. We are part of the outdoor lifestyle. 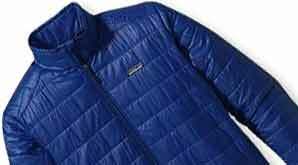 FSO isn't different than Patagonia, it is part of the Patagonia family- a cousin. 12. When does the store open? *Sneak Peek* and Ribbon Cutting event Thursday, April 21st from 5:30pm - 7:30pm! Join us for light hors d'oeuvres and cocktails at 1 Ridge Street. Our first official day of business is Earth Day, Friday April 22. If we ever get the opportunity to open future stores, they will always open on Earth Day. 13. How can people apply to work at the store? We don't have employees. We have guides! Please send resumes to: . For more information, please visit www.fountainsquareoutfitters.com. Stay up to date on the latest products and specials from FSO on Facebook and Twitter! Make sure to check out this Patagonia dealer in downtown Glens Falls. There's no place like downtown and there's no store like Fountain Square Outfitters!